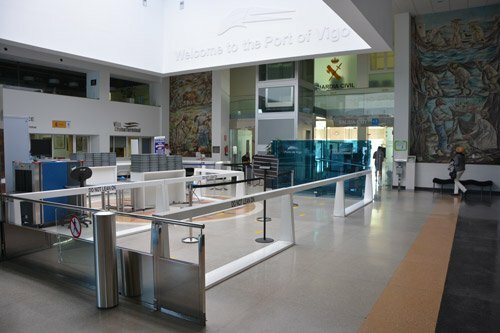 Our Vigo cruise port guide give you great information about your ship's docking location, cruise terminal facilities, transportation options and lots more! Welcome to the Vigo cruise port guide. 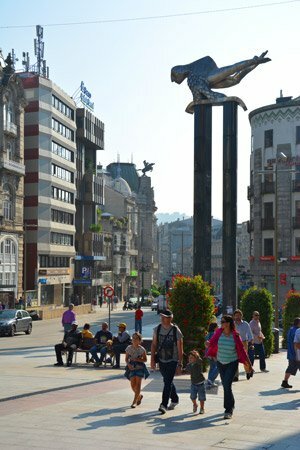 Vigo is a rather large town of 300.000 inhabitants that earned the nickname ” The Green Spain”. It is Spain’s busiest fishing port. Life of Vigo has always been dedicated to the sea, although it is also a popular retreat for the Spaniards. Whenever they want to get away from the heat this is the perfect spot to go to. Vigo is one of the coolest places in Spain. Because this is such a popular destination for the Spaniards this is also the perfect spot to meet the. The town centre is quite charming. It is packed with little market squares, charming alleyways and lots of restaurants. Especially the fish specialties is something you simply must try in Vigo. Once your ship is docked this is the gorgeous view you will have. This is the view you will have when your ship is docked in Vigo. The closest building it the cruise terminal, followed by the shopping mall and behind it you can already spot the towers of the church in the old town. 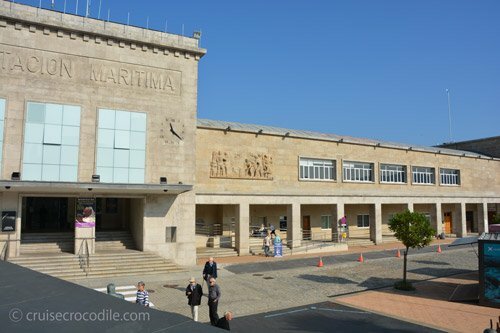 This is the cruise terminal in Vigo. In the cruise terminal you will find some shops and wi-fi at the restaurant on the 2nd floor. Cruise ships dock at Vigo’s Capitanía Marítima de Vigo. From there the city centre is a short walk. You will find it at just a few hundred meters in front of the cruise terminal. 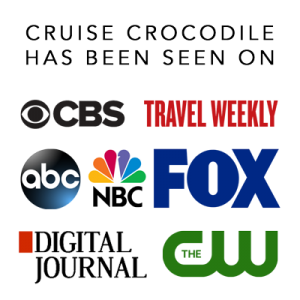 The cruise terminal itself offers lots of facilities. Here you can buy your souvenir, pick up your map at the tourist information centre or find one of the largest shopping malls. To go the city centre make sure to go through the shopping mall. The train station is about 1 km away. See it marked on the map above. From here you can take the train to Santiago de Compostella for example. Check out the train schedule online: www.renfe.com/EN/viajeros/ At the main train station is also were you find your closes car rental. There are also taxis available at the port. It will cost you about 5 euro one way into town per taxi or about 80 euro for roundtrip to Santiago de Compostella, depending on how long you will stay there. There is no hop on hop off bus, although there is a tourist bus service that usually leaves 2 times in the morning. Check with the tourist information in the terminal what their schedule is for the day you are there. There is wi-fi in the terminal that you have to pay for and also the shopping mall in front of the cruise terminal has several wi-fi spot. These are the official taxis of Vigo. The vehicles are white and they have a meter. Make sure to negotiate before stepping into the taxi. For those looking for some shopping Rua do Principe is the street to go to. Find it at about 15 minute walk from the ship. See map above. The tourist information booth is right outside the terminal. Normally the tourist information sends over representatives with all the information you need to make the most out of your day ashore. Cruise ships can dock at the Muelle de Transatlanticos. This dock conveniently located in front of the center of town. 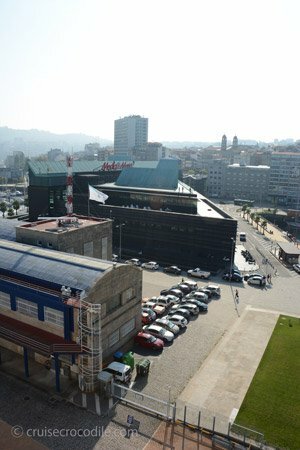 Simply walk through the cruise terminal and you will have the old town of Vigo in front of you. 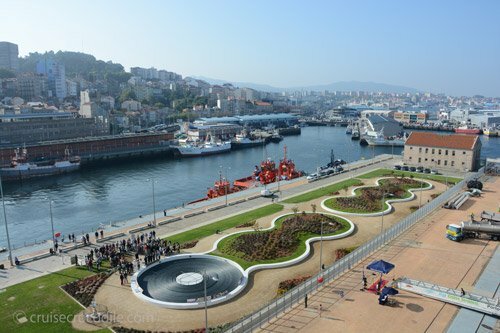 Find out more about your docking locations and tips on what to see and do in our full Vigo cruise port guide. This square marks the beginning and end of the historical and shopping district. Visit both districts to get a feel for the place. The old town is Vigo is gem to explore. It is not mentioned in many travel guides. It is located on the slopes of the town and it used to lead to Vigo’s earliest port. The old quarter still has many of its original buildings like its Iglesia Concatedral de Santa Maria on this picture. This amazing theatre in the city centre of Vigo was built in the 19th century by the people who wanted to introduce theatrical culture in the city. Today is it one of the most striking buildings in the city.